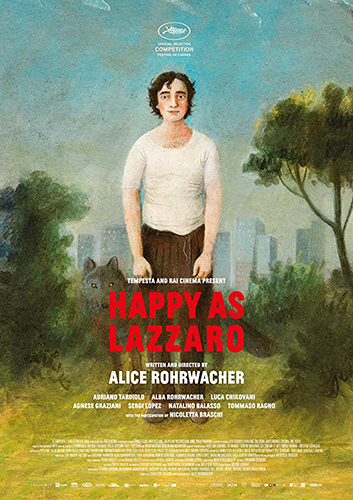 Joyce Glasser reviews Happy as Lazzaro (Lazzaro felice) (April 5, 2019), Cert. 12A, 127 min. There are two Italian films out this month that can be seen as critiques of Italian society and politics, but their content, style and approach could not be more different. Next week, writer/director Paolo Sorrentino’s (The Great Beauty) muse, Tony Servillo becomes Silvio Berlusconi at his most ‘bunga bunga’ extravagant and revealing. This week, in complete contrast, Alice Rohrwacher (The Wonders, Heavenly Bodies) gives us an epic fable about society’s inequalities, inspired by the director’s childhood memories and a bizarre newspaper story. There is much to admire in Rohrwacher’s imaginative tale with its roots in Italian history, politics and cinema. As a symbol and metaphor with myriad mythological and religious connotations, the guileless, innocent Lazzaro is a useful vessel. But as the protagonist in nearly every scene, he is too artificial for us to invest in emotionally. In an interview, Rohrwacher recalls that when she was young, she moved into a house with a mysterious past in rural Umbria, causing the neighbours to look askance at her family. Some of the previous resident’s belongings had been left behind, as though they had departed in haste. The newspaper story that caught Rohrwacher’s attention years later lets us imagine a similar scenario. It is ideal for a film about the failings of Italian society. The Marchesa De Luna (Nicoletta Braschi) a tobacco farm owner, runs her estate with sharecroppers long after an Italian law banned the feudal practice. The men, women and children toiling on her farm, are denied their own homes and the state’s mandatory education and are always in debit to the estate. The 50-odd peasants in in the film (as in the article) have no idea that sharecropping had been abolished. In the film the estate is called Inviolata which means untouched, and it was, for a long time, untouched by time. Certainly Lazzaro a naïve, sturdy man in his twenties who never changes out of his rough, dirty short-sleeved top and ill fitting brown trousers, does not know. Because Lazzaro is always obliging and never complains, people assume he is a happy simpleton and that’s the way he is played by non professional, first-time actor Adriano Tardiolo. An orphan, everyone owns him but no one really cares for him. He is exploited by the Marchesa and by the peasants who are themselves exploited. Although Lazzaro does three times the work of anyone else, when he stands in silent reverie, his fellow workers complain about his idleness. The only person who pays attention to Lazzaro is Antonia (Agnese Graziani), another peasant, who also works as the Marchesa’s outspoken house maid, and Tancredi (Luca Chikovani) the Marchesa’s son. A tall, lanky, fair skinned young man of Lazzaro’s age with bleached white hair, he resembles Daniel Day Lewis’s Johnny in My Beautiful Laundrette and might, like Johnny, be gay. However, Tancredi, while far less industrious than Johnny or Lazzaro, is more comfortable with Lazzaro than with his mother. Taking his cue from the 1973 John Paul Getty III kidnapping, Tancredi fakes his own kidnapping, hiding out in Lazzaro’s mountain cave, a place where Lazzaro goes to be alone like Saint Anthony Abbot. Though the Marchesa sees through her son’s prank, the police have been notified of the kidnapping. The authorities show up and discover the illicit sharecropping set up and close down the estate. The main house is rapidly evacuated and left, untouched by time, like the house of Rohrwacher’s childhood. Having fallen from a cliff into a ravine during all this excitement, Lazzaro has missed the exodus. A lone wolf, curious about this human lying in the ravine, holds the key to part two which takes place many years later. It would be a spoiler to say to much more, but suffice it to say that in the second half, the inequalities of the country have been transferred to the present day city. The neo-realist style of Vittorio De Sica that characterises the first part is transformed into a magical realist style, mixed with the tone of Italo Calvino in the second half. Religious symbolism, paganism, myth and literature mix in a rich web of references that bolster the story, but also tend to consume it. The Wolf, the pagan symbol of Rome’s birth in the Romulus and Remus story merges in the subconscious mind with the Christian belief in the resurrection of Lazarus. But in the film, the Catholic Church is no more generous to the poor than is the Marchesa and the failure of the organ to play, might signal the failure of organised religion in a country that counts The Vatican as a state. Like Lazzaro, the name Tancredi does not appear to be random. He is the orphan nephew of the Prince; the eponymous ‘Leopard’ in Giuseppe Tomasi di Lampedusa’s famous novel that charts another tumultuous period of social change in Italy. The Prince, like the Marchesa, is reluctant to let go of his way of life, but realises that Tancredi must embrace the change or perish with it. 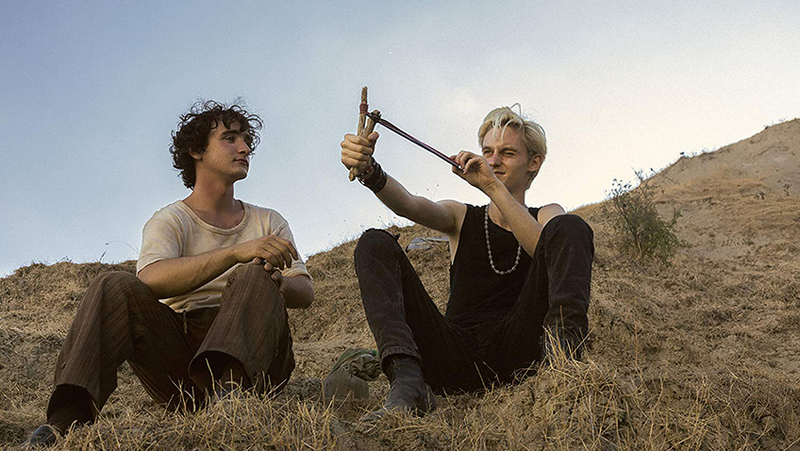 In the film, Tancredi gives Lazzaro what might be the only gift he has ever received, a slingshot, but as a gift it proves to be a double-edged sword. 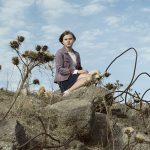 The name, Lazzaro means ‘God Will Help’, but will He? Lazzaro does not age or feel the cold – like the vampire in Let the Right One In – and has no will, opinions, complaints, or lover, and the pleasant, but indecipherable expression on his face never changes. He might be a fiction or a saint and is certainly no sinner, but as the main character in the film, he remains a tantalising symbol rather than a character. We can appreciate the film on an intellectual level more than we can relate to it emotionally.